Hot cold, big small, tall short, happy sad, vibrant dull, opposites all – in just a few minutes one can come up with so many. 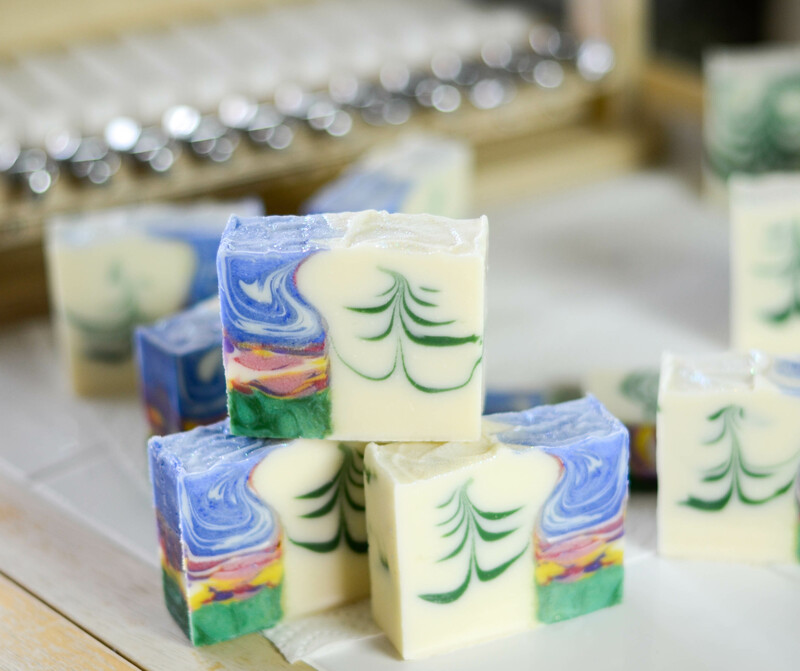 This month’s soap challenge is embracing opposites – the idea was to portray your chosen opposites in soap using a loaf mold. The first idea I had was to see how many opposites I could get into one design. 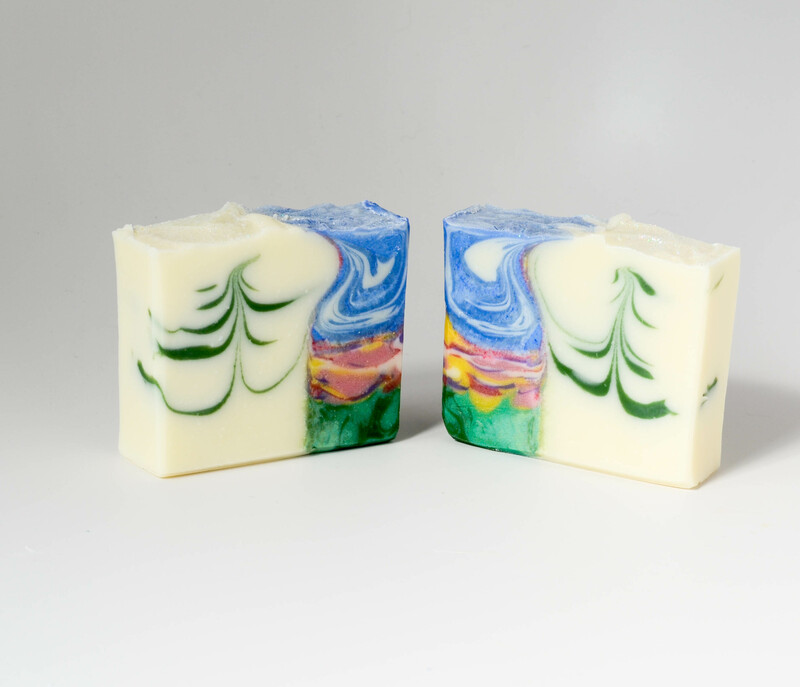 What came to mind was horizontal and vertical, cool and warm colors and then I wondered if there was such a thing as opposite fragrances. 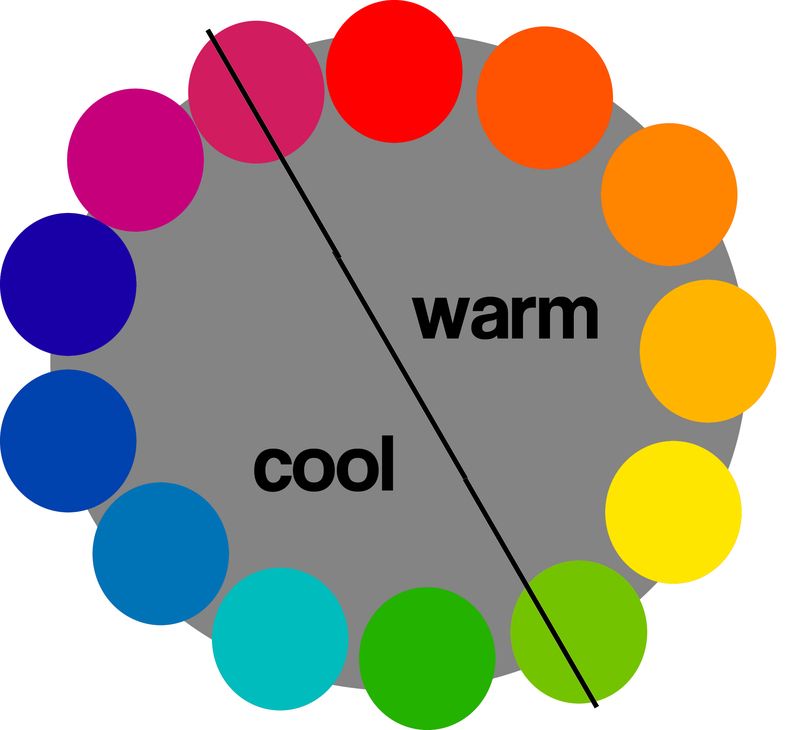 A quick Google search came up with a fragrance wheel – much like a color wheel the opposite fragrance are supposed to blend. I am posting a copy below in case there are others like me who didn’t know this existed. Also including a warm/cool color chart here and will explain why. So with the green being off and the horizontal stripe needing some improvement it was off to another design. This time I settled on winter and summer. For winter I wanted a pine tree in a snow storm (a rather simple design) and for summer the idea was to create a wild flower meadow with a blue sky and wispy clouds (a complex design). I used is Peppermint essential oil for the cold winter and although I wanted to use a real flowery scent I decided to go with just Lavender essential oil to allow time to pour. These challenges are always learning experiences for me. If I had time to do the summer/winter soap again I would definitely use squeeze bottles for the flowers and pine tree. My squeeze bottles are huge (probably 32 oz) and since I only needed a small amount of soap batter in these design features I decided to try it free hand and use a spoon to dribble the soap. Had I used the squeeze bottle I think the lines that formed the pine tree would have been a more consistent thickness and the colors of the flower field would have been more distinct. Also I thought I was being very careful in removing the divider but I must have tilted it a little at the top. 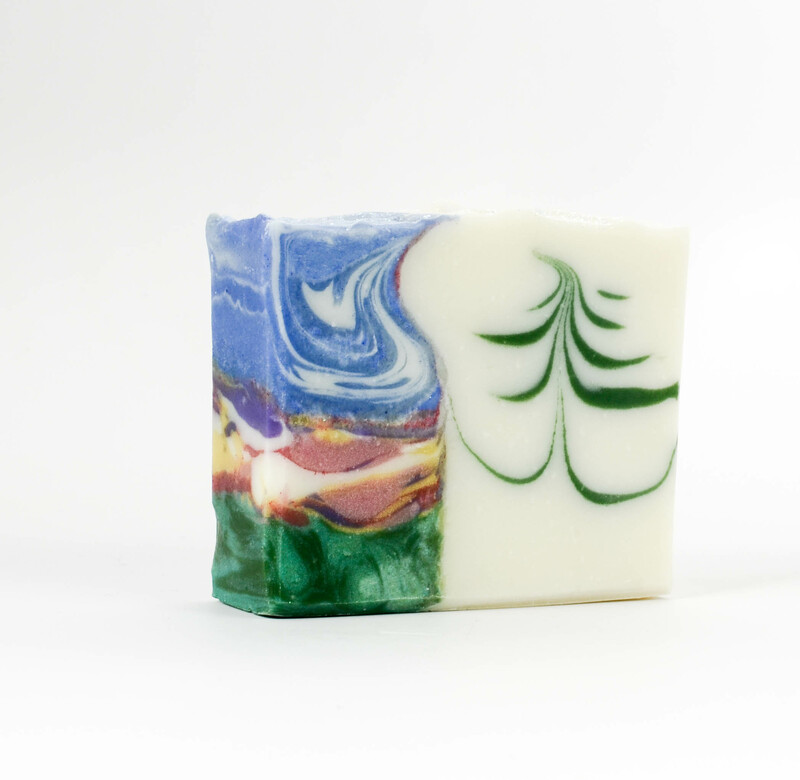 Nevertheless I am still pretty pleased with the way the summer/winter soap turned out and that will be my enter this month. I love the way these challenges push me outside the box. This month was particularly fun – thank you Amy! These are brilliant, Bonnie! I think your pine tree is perfect (and adorable) and the little pictures made on each side are like paintings. I like how the divider line isn’t perfectly perpendicular too, it adds a nice dimension to the sky. Thank you Lisa. You made my day! Oh my God! Amazing soap!I return to it 3 times! 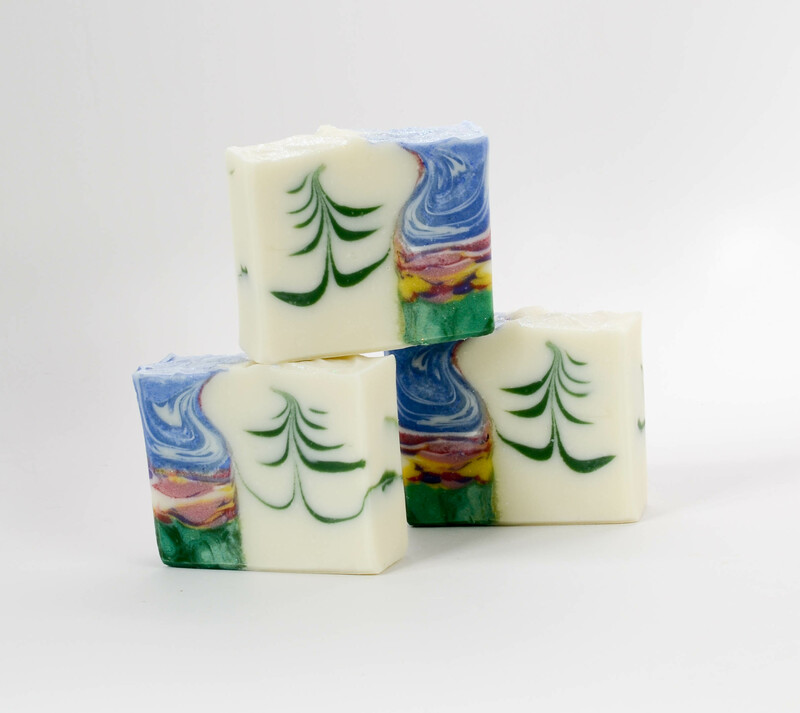 Love your winter/summer soap! And who knew there was a fragrance wheel? Thanks for sharing! Thank you. 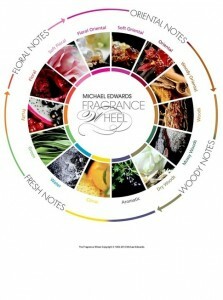 Yes I will be using the fragrance wheel again as mixing fragrances always puzzles me and this really helps. These are gorgeous- and I like the slight wonkiness of it all! Agree, brilliant and beautiful! Love your theme and how you put it together! 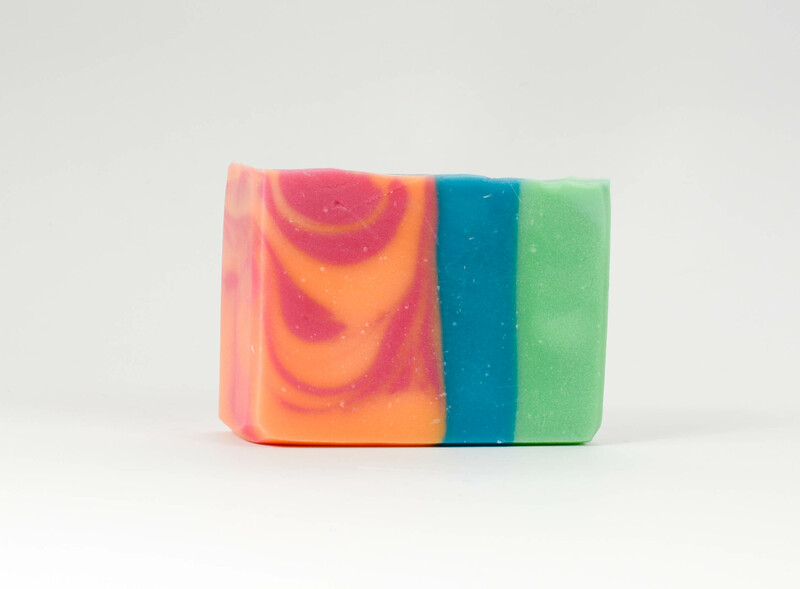 Your soap catch my eyes. Very nice. Love your idea of the wheels too. Well done. Congratulations on winning the embracing opposites soap challenge, Bonnie! 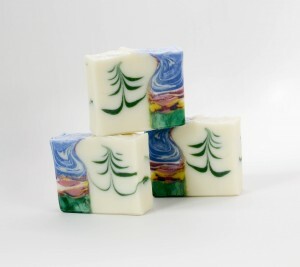 I just love these soaps! They’re so beautiful. Thank you Holly. I am so excited about this.